i'm still trying to adjust to paying more than $10 for vintage clothing ... etsy is training me well, haha! you look gorgeous! and i like those shoes too. Great dress! And again, oh my GOD, the puppy is so cute! I love how your puppy has to get in on the picture. Already a fashion blogger...LOVE IT! That dress is really cute but I can understand how you feel about the $30.00 price tag. Sometimes "good vintage" costs a little more. 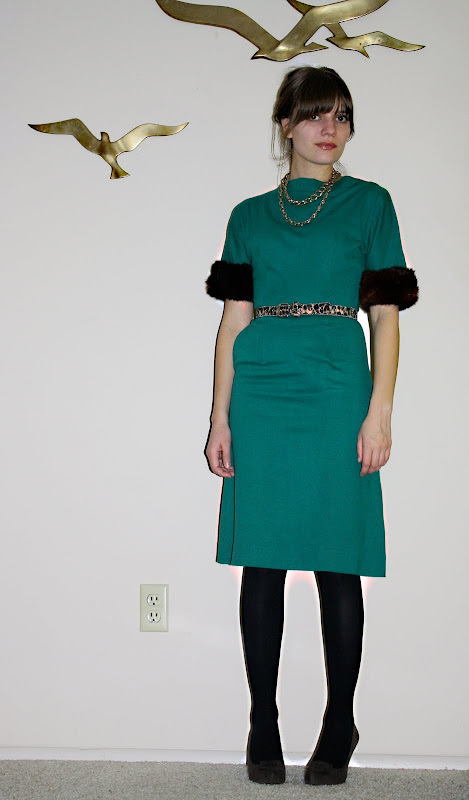 Plus you dont want some Joan wannabe busting it out for halloween and ruining it do ya? Beautiful dress! You look stunning!! And the dress is lovely. Totally worth every cent! Those cuffs are so swanky! Those pumps are fantastic, and I love the sleeves on the dress. And Igby is freakin' aDORable! I love that dress! I'm amazed how you find these totally cute things in thrift stores! I will have to do more thrift store shopping! I've been thinking of buying those taupe pumps for awhile now. Were they comfy? The pumps actually are pretty comfortable. They have a nice padded insole and a hidden platform, which makes the heel height more manageable. This is absolutely gorgeous! Love the dress and love the shoes!! the dress is totally worth it. gorgeous, and it does fit you perfectly! I hear you on the price. I recently bought a vintage dress for $20, and was questioning it, as that seemed a bit high compared to what I'm used to at thrift stores. I love the dress. 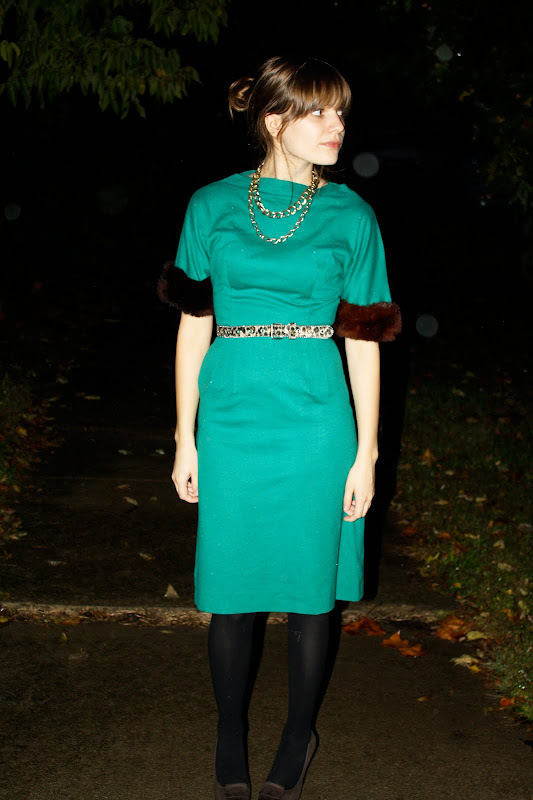 The fur puffs on the sleeve are great, and I love the belt and necklaces you paired with it. Your puppy is absolutely adorable!! the shoes, the fur detail, the belt, the hair, everything! i love love love that dress! and the little pug is simply adorable! Your dress is stunning. Love the fur detailing! And cutest dog ever! and I know what you mean about vtg!! I never buy vtg online because it is so overpriced, I always look in thriftstores but if I find something by a designer I'm willing to shell out a bit more... but I always remember- it's basically used clothes. mmmm.... I agree- $30 it takes an aweful lot of convincing to spend $30 on a dress. But Here its utterly worth it! $30 was worth it because it's timeless yet trendy and you knocked it out of the park... again! And congrats on being a baby mama to Igby. So freaking cute! everything about this outfit is lovely. love that dress. great find. Honestly, I'm the same when it comes to being cheap... generally when I go shopping, my limit is $15. But if it's worth it, I'd say that $30 is a decent price! Your dress is amazing. I know, its hard to adjust to spending more when one is used to hunting for good pieces for a low price at thrift stores. I always try to assess how unique the piece is and how much it is worth to me. Overall 20-30...occasionally more...is my max. the dress is flawless and you look beautiful. congrats on the new puppy, he is super cute. Love this outfit. Mad Men is inspiring. Your puppy is so cute! OMG.